This afternoon, shortly after 12pm, we were informed of a Garda response at Flynn’s B&B, 16 Gardiner Street upper, in relation to the attempted eviction of a homeless family of four who are resident in the accommodation. Originally published by Take Back The City Facebook page. 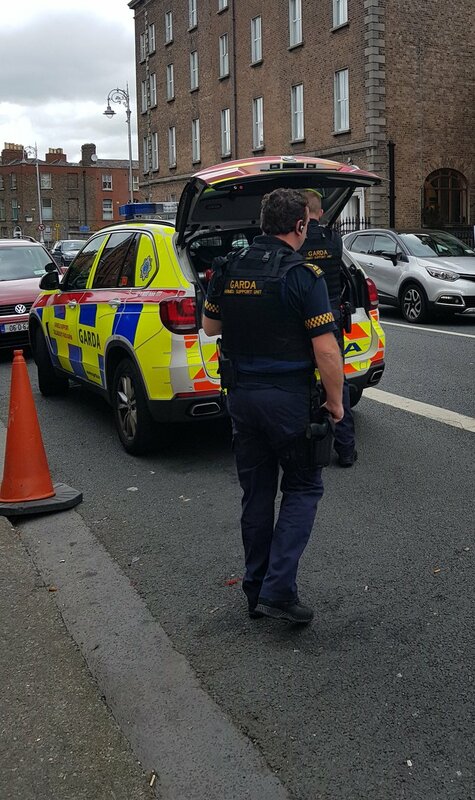 Upon our arrival at the scene, we were shocked to find a heavy Garda presence – including several members of the Armed Response Unit, wielding machine guns and battering rams. A number of members of the unit were outside the building, others were within, and there were 2 members posted on the roof of the building, threatening to abseil and break through the window of the family’s room. This is an outrageously heavy-handed, SWAT-like response in a situation which has clear procedural guidelines. These guidelines were completely ignored today; a situation that should have been mediated calmly was instead immediately escalated to a militaristic level. We utterly condemn the actions of the management of Flynn’s for failing to follow procedural guidelines and the actions of An Garda Síochána. One week after the scandalous events outside North Frederick Street, where masked members of the Gardaí assisted an unlicensed private security firm in the violent eviction of occupants, and the mistreatment of supporting members of the community, we ask how the State can legitimately claim that they act in the interest of public wellbeing and upkeeping of the peace. The family in question have two young children – how is an Armed Response presence outside their door anything other than terrifying? Today’s scenes, and those last week, absolutely contradict that narrative. We now call on anyone who is in the area to provide support outside Flynn’s B&B until the family have had the chance to properly meet with Dublin City Council authorities and management. Take Back the City, September 17, 2018.